Mid-table Bellshill Athletic pushed second placed Shotts Bon Accord all the way before going down to a frustrating 2-0 League One defeat at Hannah Park on Saturday. The game suddenly came to life in the 42nd minute when Bellshill keeper Fitzpatrick was slow to react to a cross from the right wing allowing Aitken to knock the ball home and give the home side a 1-0 lead at half-time. The second half saw a livelier Athletic come out and keep pressing Shotts. ’Hill created a few chances but found Shotts keeper Murdoch in good form on several occasions with some good saves denying Bellshill the chance to equalise. Against the run of play, Shotts put the game to bed in injury time when a long ball found Love in space and he fired home to put the home side 2-0 up and secure them all three points. Bellshill: Fitzpatrick, Chalmers, O’Donnell, Simon, Nolan, Gilchrist, Brannigan, Byrne, Brennan, Nichol, Stewart (McKeown). “The Shotts people I spoke to after the game said that a draw would have been a fair result,” Bellshill match secretary Eddie Lynas told the Times and Speaker. “Our second choice goalkeeper was slow to react from a corner, giving Aitken the chance to score. “We had a lot of chances in the second half but if you can’t take your chances then you’re not going to get any points. “A 2-0 defeat didn’t do us justice. I thought we were well worth a point, especially on the second half performance. Eighth placed Bellshill are back on league duty this Saturday when Wishaw are the visitors to Rockburn Park, kick-off 1.45pm. ’Hill will still be without injury victims Conor MacLeod and Richard Kane, although fellow striker Alessandro Savarese is nearing fitness. “Our main aim this season is to establish ourselves in this league and I think we will be able to do that,” Eddie added. 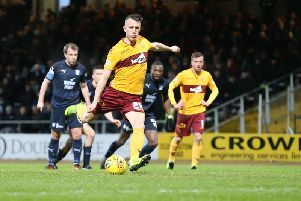 Motherwell v Dundee: WIN a pair of tickets!